The Earth didn’t move for either of us… thank God! | "MASTERS"
The Earth didn’t move for either of us… thank God! Posted on October 3, 2015 by Mark and Sarah - MASTERS! MARK: “Where are you looking forward to visiting most?” This probably the question we were asked more than any other before we left the UK. In truth, we were both looking forward to visiting all 19 countries, for a variety of different reasons. 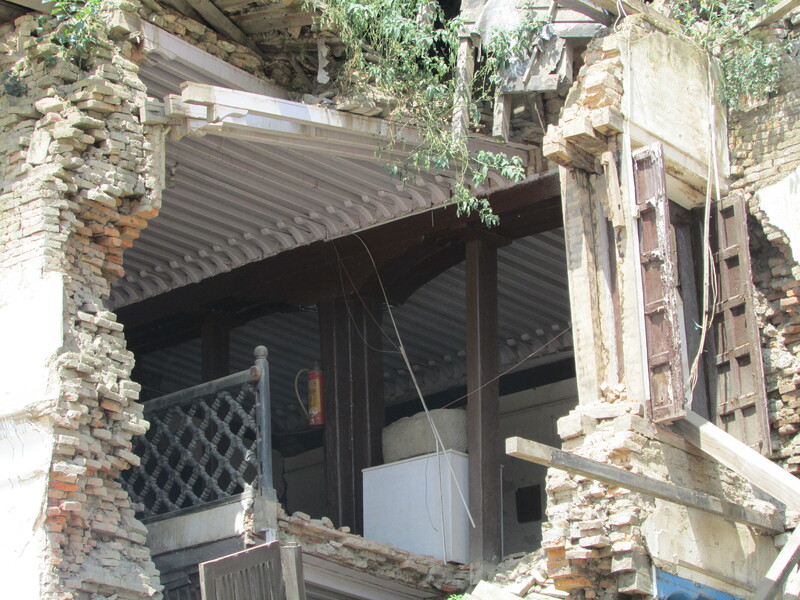 But Nepal for me had special significance, particularly after the devastating earthquake earlier in the year. 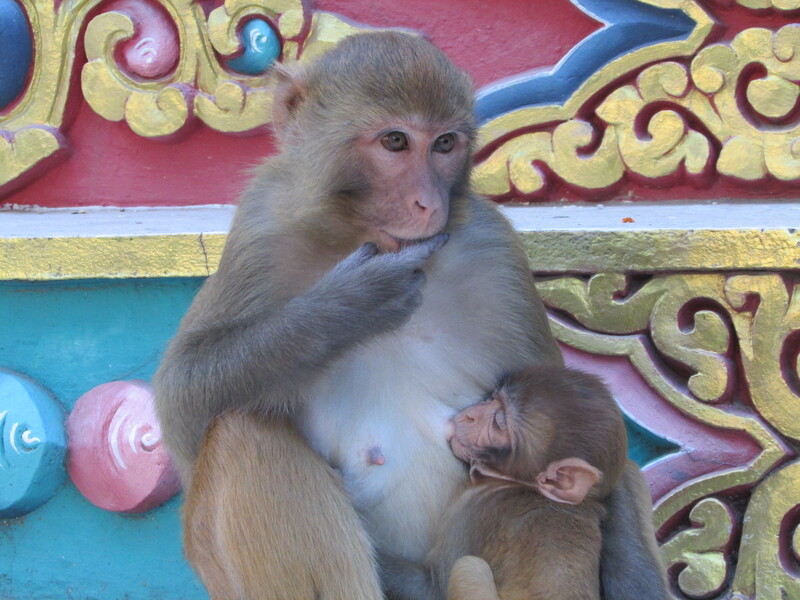 We’d always wanted to visit this beautiful country to see the exciting wildlife in the south (not much known), the majestic mountains of the north and take in “hippy” Kathmandu located in the central valley. In April, after the devastating earthquake had hit, I visited the Foreign Office (FCO) website all the time and nobody was more pleased than me to see the travel advice change in July change to “safe” in the areas we wanted to visit. The fact was, we were going irrespective of any FCO words of wisdom. The flight tickets in (from India) and out (to China) had long since been booked and were non-refundable. But the real determination to visit was not financially driven, it was simply to support the people there. The “Tourism Tap” had literally been turned off overnight – a real problem for a land-locked country that depends heavily on the visitor $ as part of it’s economy. Krishna, the Manager of the Hotel Happy Home in Kathmandu who I had developed a close “email” relationship with, was “so happy” to know we were not cancelling our trip. No way were we going to let him down. So it was with a degree of anticipation, trepidation and excitement when we set off from Southern India, on a journey of over 2,500 miles, involving three planes and over 14 hours of travel. I could not wait to see how the country was coping and whether people still slept in the central park for fear of further tremors. After all, there have been limited news reports for some time in the UK. It’s funny how the media love to cover tragedy and then rarely return to the scene a few months later to report on what has happened during the intervening period. The flight in was a scary one to say the least, flying between mountains in to what is little more than a military air strip. With a sudden jolt and hard “smack” on to the concrete runway, the Jet Airways, Boeing 737 (900 series) suddenly slammed on its brakes, our seat belts strained and the Rolls Royce engines whined in to reverse thrust. The end of the runway was approaching at an alarming rate, but we stopped just short of a row of houses. $50 (US) and our Visas were paid for and within 25 minutes of touch down, we had been reunited with our bags – always a nice site to see on the luggage belt. Better still, there was an A4 sign outside the Terminal Building high above the waiting taxi men with the words Mark Bailey. 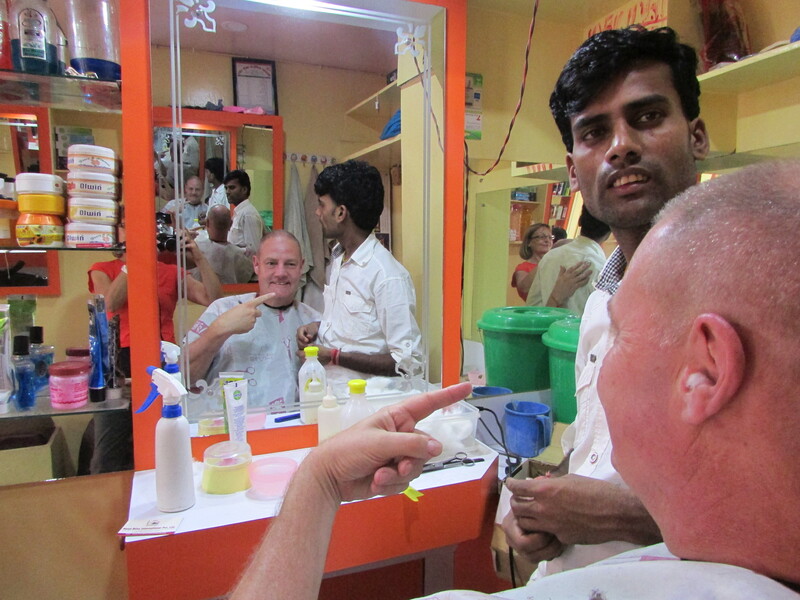 The emails had worked and the trust given to Krishna had been rewarded with a welcoming smile. 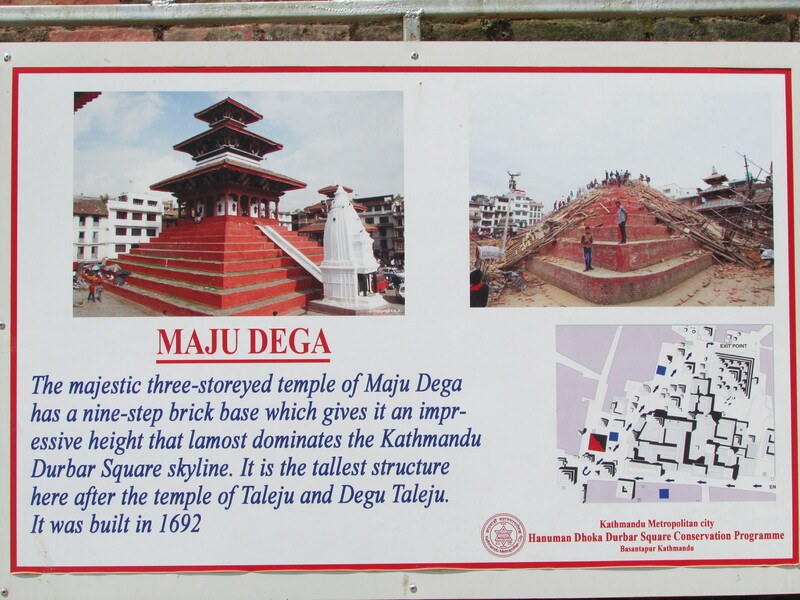 We’d arrived in Kathmandu. Within seconds, our back packs were “launched” with brute strength on to the roof of a grey, beat up old Toyota People Carrier and we were off. There was no rope to tie them down. But the windows worked which was a blessing as the heat was intense. Average temperature at this time of year is normally 23-25C, but we were hit with a furnace blast of humid, dusty air, with the mercury showing 33C at 1630. As we left the airport, I immediately started looking for signs of the earthquake. But I couldn’t see any. So just where were all the devastated houses? How come life looked so normal? Where were all the Red Cross Relief Workers? The answer. There weren’t any. The truth was that 95% of the city had not been hit at all. I couldn’t believe this. Frimley High Street and its ugly concrete façade looked more of a mess than this place. 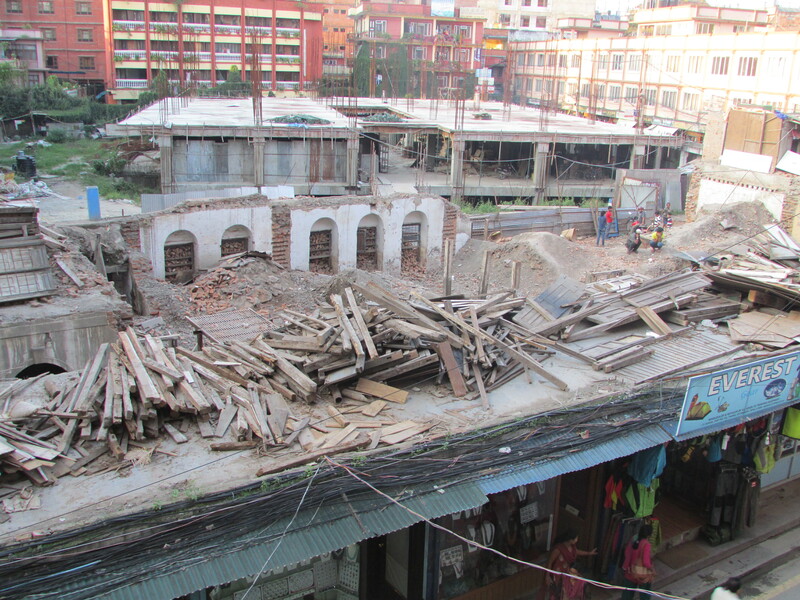 In fact the first sign of the earthquake was when we opened our hotel blinds to see the below view. View from our Kathmandu hotel window. A school no more. This was a school. Fortunately there was no loss of life, the remains though did speak a different story. A young teenage boy emerged from a square, hand-made “crate” this was his home on the remains of what had been the classroom. He started washing three T shirts in a bucket. I asked Krishna what the truth and reality was, as I was confused to say the least. 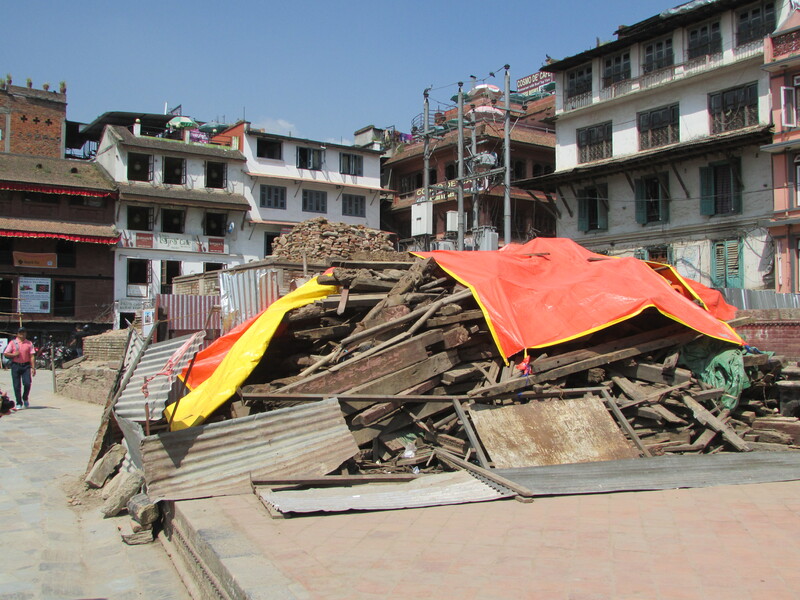 He confirmed there had been a number of deaths in Kathmandu, most notably when the Dharahara Tower collapsed killing 80 people and trapping over 120 more. But he went on that in the main, most of the damage and destruction had been in the hills and mountains where over 9,000 people had died and in excess of 23,000 injured, many seriously. 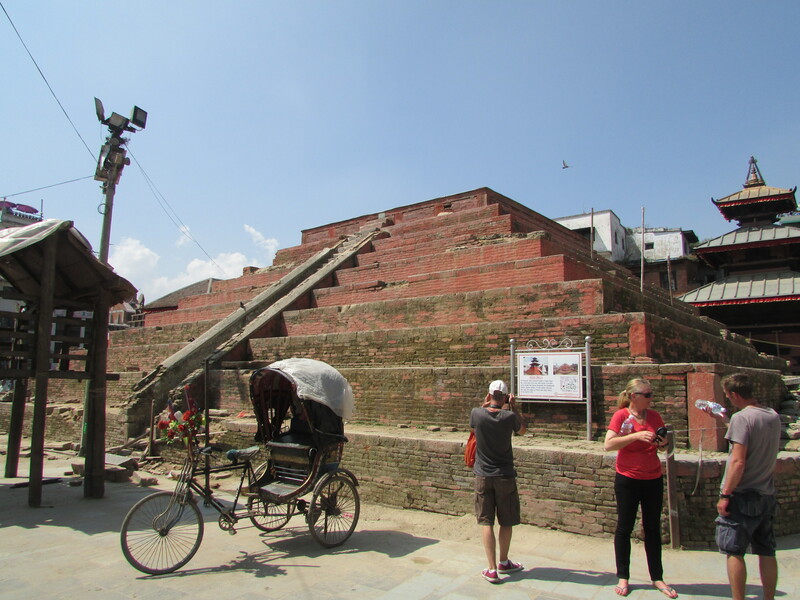 He also told us that a number of the temples and historic sites in and around Kathmandu had been affected because of their age. They simply could not withstand the massive 7.9 (RS) earthquake, many no longer in existence. So, next morning, after a roof top breakfast overlooking the misty mountains, we set out to investigate for ourselves the Thamel (old town) area. Sadly it wasn’t long before we could see for ourselves the massive hammering the old temples and shrines had taken. The poignant “before” photos now displayed by the Government Tourist Service showed what the buildings had been like a few months ago. My photos show what is left. Enough words, let the photos speak. 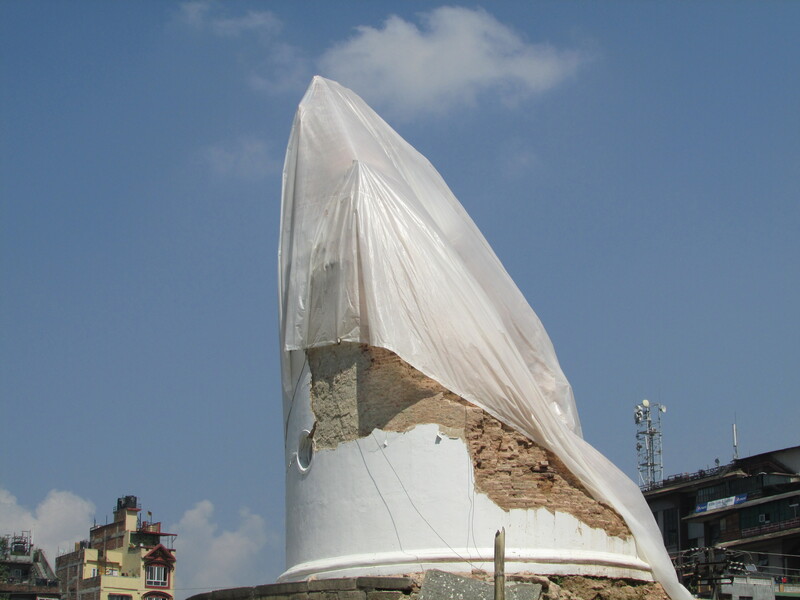 The most striking image of sadness was the 10 metre tall white stump – all that remained of the Dharaha Tower. This historic white “lighthouse” shaped building, built in the 19th century was a major attraction, the tallest building in the capital with a viewing balcony at the top. The Tourist Entry signs were still there, an eerie reminder of what had been. Now it was all sealed off with corrugated iron and a draped white tarpaulin, shrouding what was left as if a dead body had been covered by a sheet out of respect. But life was going on. We walked through busy markets, the sound of bartering, buying and selling filling the air. Wafts of cinnamon and ginger, mixed with gut wrenching smells of goat carcusses wafted up our nostrils. We headed along “Freaky Street” – the epicentre of the Hippie trail during the early 1960s. 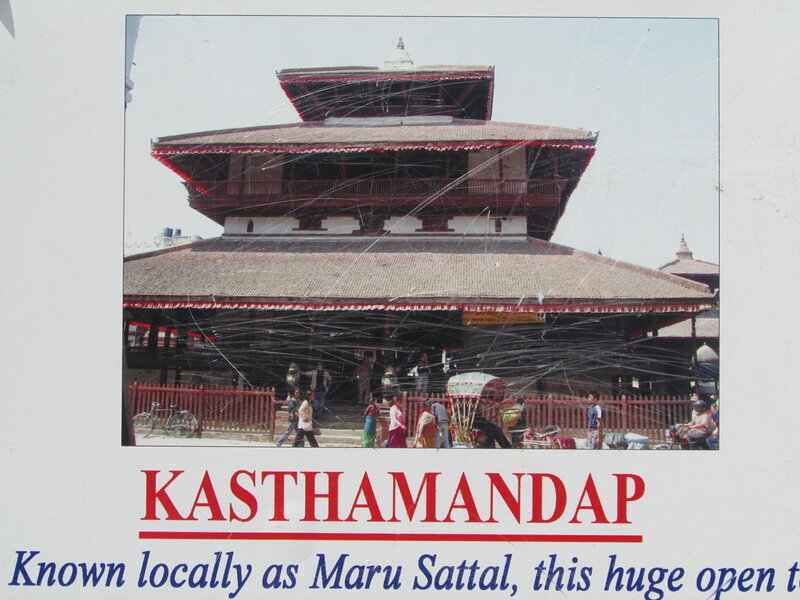 We discovered that during that time, the Nepalese government ran legalised hashish shops. They even had direct bus services to Freak Street from the airport and borders targeting hippies looking for a “smoke”. I confess, the nearest I have ever been to drugs are the orange Junior Asprins my mother used to give me. No, I tell a lie. I was once offered Viagra by a guy on a beach in Barbados. I did though quickly tell him I had no need and quickly referred him to Sarah for confirmation of the fact… So I was chuffed to bits that I was asked if I wanted anything to smoke by this rather shady dreadlocked local… “Marijuana or hashish man?” Sarah was watching, I declined, so decided it was safer getting my hair cut although when I saw the barbers cut throat razor and he proceeded to use it, maybe the “pot” might have been the safer option. something for the weekend Sir….? It was a light hearted moment that was suddenly cut short. As we left the barbers, we went round a bend in to a small street. Rubble everywhere. People clambering over bricks and beams. A freezer clearly visible in a gaping hole where once a roof was. 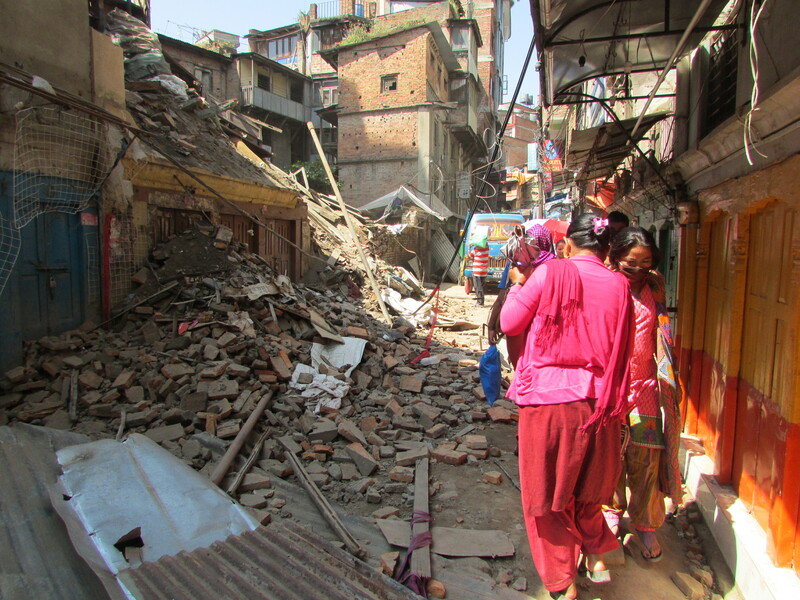 Reality hit, as pockets of destruction were still all too easy to find. 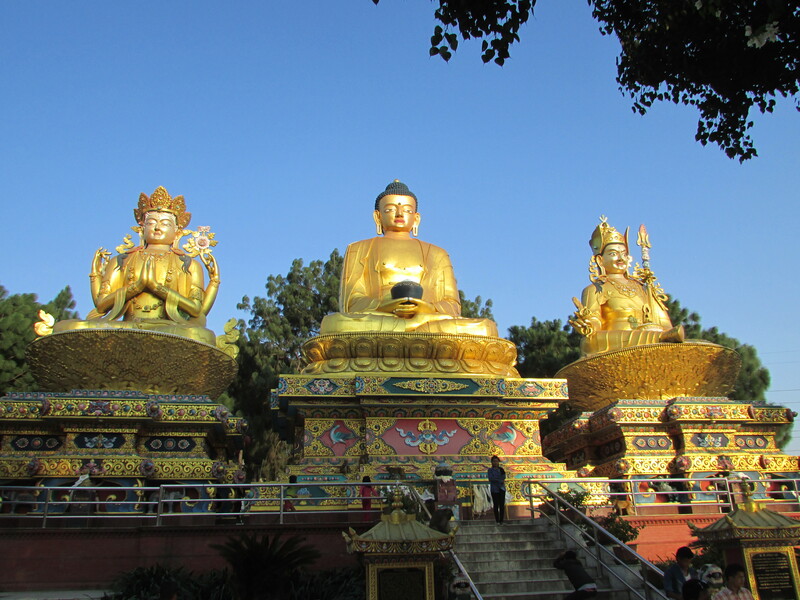 I could write much more on the roller-coaster of emotions we felt in Kathmandu, but fear that you dear listener would start to tire of my ramblings. 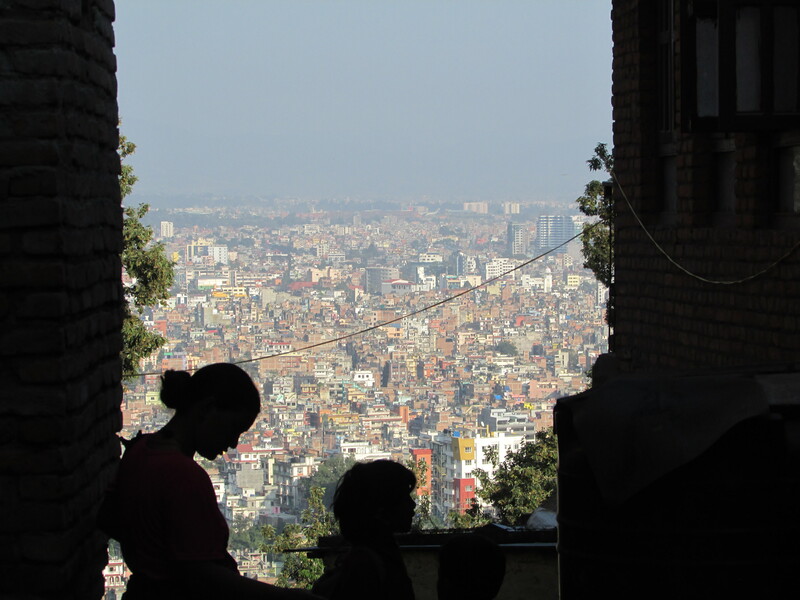 So to end with, a couple of shots from Monkey Temple overlooking Kathmandu and a photo of people queuing for fuel. 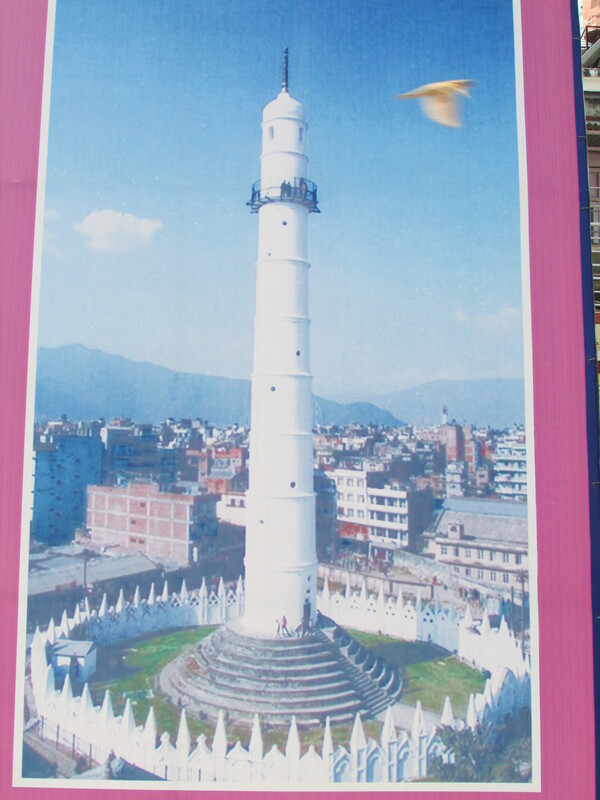 Oh, didn’t I say, Nepal is gripped by another major incident. Not an earthquake, but an international spat involving India who have allegedly “blocked the borders” in response to the new constitution that 95% of the Nepalese have voted for. The 5% that did not are supported by Mr Modi. Have these people not suffered enough? It makes you think. There are now real concerns for the supply of fuel and food. One of the oldest countries in the World and now the newest democracy. Still fighting, still facing challenges, still smiling. Onwards now to south Nepal through the hills on a rickety old bus. Six hours – only 120 miles – how does that work? Not sure, but if we see rhinos, crocs and tigers it will be well worth it. Enjoying the narratives! Are you going to be doing some voluntary work in Nepal? And that lovely comment after you were hammered…. ahhh. Can’t say much as Reading FC beat us.. hope all well Canny Marra. Thanks Ally – not sure about the “real talent bit” but I love to write these blogs and your comments inspire me to write more – you have been warned. Hope the H is ok – miss that 8.5 Vol special brew! Love the photos – still behind with my reading though! I agree with M & M – it’s cotton wool in the ears!!!! Fantastic pictures. I can see the book now! Was Mark bored with the barbers patter, so had to stick cotton wool in his ears? I’m afraid ours looks very tame fare in comparison but lying on a Greek island has never held much excitement, apart from incoming jelly fish and to date we have only seen one. Travel safe and keep ’em coming, it’s truly wonderful to share. Stunning pics as ever and so interesting to hear what the situation is really like.